Quantum dots (QDs) are semiconductor nanocrystals with the diameter ranging from 2 nanometers to 10 nanometers. Quantum dots are nanostructures with properties varying depending on their shape and material. Due to particular electronic properties of quantum dots, they are used as active materials in single-electron transistors. A quantum dot sensor makes use of materials that use the quantum dot technology and a simple method of integration, enabling about 95% of an image to be occupied. QDs have broad absorption spectra with wavelengths ranging from ultraviolet to visible, depending on the particle size of the quantum dot. QDs are used as active sensor elements in biological applications such as cellular imaging, real-time tracking of the cells and molecules, detection of tumor, and observation of cell components. The quantum dot sensor market is projected to expand at a CAGR of 11.2% during the forecast period and reach value of US$ 195.4 Mn by 2027. Rising demand for enhanced sensor technologies and increasing awareness about energy-efficient solutions have increased the adoption of quantum dot products. The quantum dot technology offers numerous advantages such as energy efficiency, ultra-high definition, low cost, and high brightness. Silicon-based sensors are difficult to be used in the manufacture of next-generation image sensors. The new sensors use the quantum dot technology and a simple integration method that captures maximum portion of an image with extremely high quality. Also, quantum films is the next-generation camera platform. Increasing use of quantum films in mobile handsets, cameras, and other applications has augmented the demand for small-sized, high-performance image sensors. Interest in utilizing quantum dots (QDs) in all types of sensing and imaging applications continues to grow. Quantum dots is an intriguing area in the field of liquid crystal display materials technology. Companies are reporting good results with these semiconductor materials, in terms of color gamut and efficiency. Nanosys is working with AUO Optronics, 3M, and other companies to incorporate the quantum dot sensor technology in their products. It recently received funds from Samsung Venture Investment Corporation for incorporation of the quantum dot technology into sensors. Furthermore, quantum dot products are made of materials such as zinc, cadmium, sulfide, selenide, aluminum, gallium indium, and indium arsenide. In the field of optical data processing, quantum dots serve primarily as a light source. They are also used as amplification mediums in lasers. However, use of gallium arsenide is restricted to special applications and it does not compete with silicon in the semiconductor industry. Since cadmium is a toxic heavy metal and it is dangerous to both human health and the environment, its use is restricted by various environment-related laws. Several regulatory authorities have limited the amount of cadmium used in consumer electronics devices. This hampers the global quantum dot sensor market. 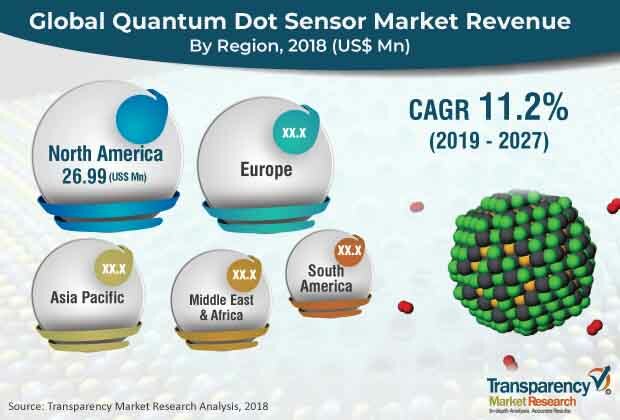 Attracted by the anticipated growth of the global quantum dot sensor market and underlying latent demand, several players are planning to enter the global market for quantum dot sensors. In November 2015, InVisage Technologies Inc. introduced camera sensors under the brand name: Quantum 13. This camera sensor records images in low and high light. It is an electronic image sensor that uses quantum dot films, instead of silicon, to capture the light. InVisage Technologies Inc. is the only prominent player operating in the global quantum dot sensor market.